Rick Wakeman can remember the day he fell in love with cars. It was 1955 and the pop charts were full of Bill Haley and Dickie Valentine, while Laurence Olivier was scowling his way to an Oscar nomination as Richard III. Wakeman was five years old, living in a small semi in West London, eagerly waiting for his dad, Cyril, to arrive home from work. ‘Dad pulled into the drive in a black Morris Eight,’ says Wakeman, eyes glistening with Proustian joy. ‘This thing was almost 20 years old and it’d had a few scrapes during the war, but it was ours. We had a car! As I ran out the front door, I could see all the neighbours rushing across the road. No one we knew had a car. People just wanted to touch it… to sit in it. It was a love affair that has lasted more than 60 years. Wakeman – latterly a TV presenter but best-known as the keyboard player with 1970s rock band, Yes – has owned more than 200 cars and currently has seven sitting in his sizeable Norfolk garage. The collection includes a 1988 Jaguar XJS convertible, a 1970 MGB GT and a 1984 Dodge Ram custom van. Half-jokingly, Wakeman wonders which has cost him most money, the car fetish or his three divorces! You look at a Morris Traveller or an E-Type Jag and you’re looking at history. I’m sharing a cup of tea and a cheese sarnie with 69-year-old Wakeman in the British Motor Museum café near Warwick. He’s here for a guest appearance on one of his favourite TV shows, the National Geographic Channel’s Car S.O.S – just about to start its seventh series, which includes a couple of specials filmed at the museum. Have you seen DIY SOS – aka The Big Build – with Nick Knowles where deserving families get their houses renovated? In Car S.O.S, people are reunited with their rusty old Triumphs and Land Rovers, restored to showroom condition by presenters Fuzz Townshend and Tim Shaw (above). Wakeman’s point about cars becoming treasured members of the family is borne out by the often-emotional conclusion of the show, when unsuspecting owners – nominated by crafty relatives – are reintroduced to their pride and joy. I’m sure I wasn’t the only one who shed a few tears when the owner of the Lancia Delta Integrale sadly passed away before he got to see his finished car during the last series. 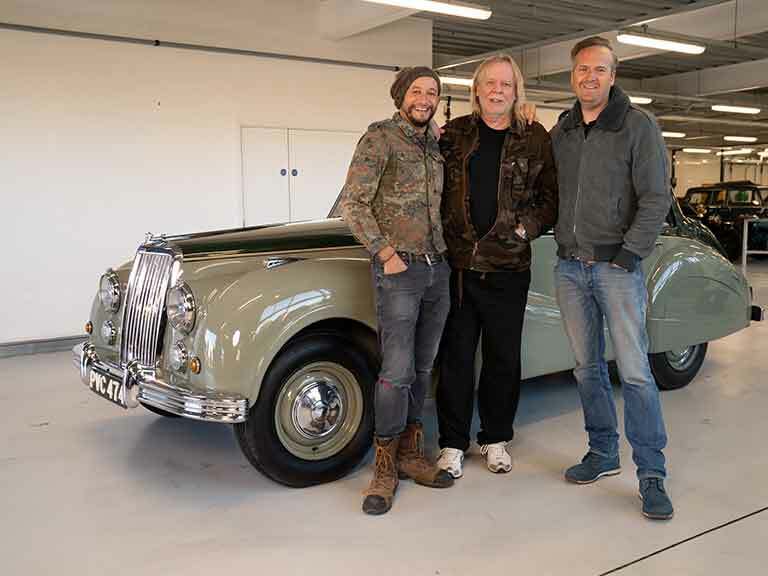 Cars and rock stars go hand-in-hand, and Rick Wakeman has been a rock star for most of his life. A teenage musical prodigy, he studied at the Royal College of Music, but left early to become an in-demand session musician for the likes of Elton John, T. Rex and David Bowie. In 1971, he joined Yes, but continued working with other artists as well as releasing his own hugely successful solo work. His most recent albums, 2017’s Piano Portraits and last year’s Piano Odyssey, both made the Top Ten. ‘People think musicians earn tons of money,’ says Wakeman, ‘but I started on 18 quid a week. Hardly enough to get myself a flash motor! I was driving around in an old Ford Anglia 100E. It wasn’t big enough to carry my music gear and the back axle used to whine more than my third wife, but I loved it. Wakeman smiles broadly when I mention that the extravagant taste in cars seemed to coincide with a sudden interest in outlandish, skin-tight outfits and glittering capes. There’s even a picture of him with his face and sideburns spray-painted gold. ‘I was a young guy living a dream life,’ he chuckles. ‘It was all about having fun. I remember seeing a 1923 Model T Ford in Los Angeles and thinking, “I’ll have that”. So I shipped it home. Cost about eight grand. As I drove it out of Tilbury Docks, a bloke stopped me and offered me ten grand. Rewind a few years and being interested in old cars was a bit like being a trainspotter or a twitcher. It’s an experience I share with Rick. Our friends and relatives indulged us, while secretly rolling their eyes as we waffled on about getting the MG Midget’s seats reupholstered. When I met my wife, I had a big poster of a 1970s Vauxhall Chevette hanging in the living room. The first time she came to visit, I took it down, just in case she thought I was a bit… weird. My, how things have changed. Nostalgia is now big business. It’s cool. People want old stuff. Original Swinging Sixties fashions change hands for silly money. Vinyl records are now sought-after musical treasures. As for classic cars, flick through your TV channels and you’ll find dozens of shows just like Car S.O.S, Wheeler Dealers and Chasing Classic Cars. And not just in the UK. This is a worldwide phenomenon. So why this sudden interest in the past? Armchair psychologists could have a field day. [To be read in a scholarly voice:] ‘In these turbulent times, we return to the safety of our younger days.’ Yes, that could be one reason. Or maybe we’re just bored with the relentless monotony of modern cars. Could you tell the difference between a Ford Kuga and Vauxhall Mokka? Stand them next to a Riley Pathfinder or a Ford Capri. Which would you rather be driving? ‘Most modern cars have no character,’ moans Wakeman, easily slipping into his Grumpy Old Men persona. ‘They’re soulless. You look under the bonnet and it’s a mechanical desert. No detail. All controlled by computer. Compare that with the 1955 Armstrong Siddeley Sapphire that I drove for today’s filming. Beautiful to look at. Beautiful to listen to. Open the door or lift the bonnet and you get an instant connection. It’s a machine, but it talks to you. Wakeman does have a modern car. Well, modern-ish. It’s a 13-year-old Lexus. ‘It starts, stops and does exactly what it says on the tin. If I’m doing a gig in Kiev, it gets me to the airport and back in comfort. And it’s also as boring as hell! There’s no romance. No memories. ‘Here’s the interesting thing,’ he adds. ‘Music is my job and, over the years, I began to see a connection between music and classic cars. It’s all about memories. People have favourite songs because they remind them of certain times in their lives. When I do gigs, people often come up to me and say, “I love that song because we played it at our wedding”. The cars have become the 3D photos of my life. Danny Scott is a style and beauty correspondent for Saga Magazine.